The first Soviet giant bomber was the huge Myasishchev Mya-4 Bison swept-wing turbojet bomber, developed on the orders of Stalin beginning in 1949 as a plane that could reach the United States and return to base. It first became known to the West in 1955 when, much to Soviet Premier Nikita Khrushchev’s satisfaction, a scheme of repeatedly flying the limited stock of Mya-4 Bisons over the reviewing stand at the Moscow air show achieved its desired effect: U. S. military leaders within the Strategic Air Command (SAC) loudly pronounced the need for in- creased funding to reduce the so-called bomber gap. Such pessimistic claims were later found to have as much to do with SAC self-aggrandizement as with actual Soviet capabilities. The Bison entered service in 1956, but only about 150 Mya-4s were produced. The Bison was, in fact, a strategic white elephant with a maximum range of 7,700 miles, far short of intercontinental round-trip flight. Bisons were, in fact, employed largely as tanker and reconnaissance aircraft. Following the Second World War both the British and the Americans rather rested on their laurels where radar research was concerned, unintentionally allowing the Soviet Union to catch up and in some respects to overtake them. However, once Washington had decided its former wartime ally was now definitely an enemy, a motley assortment of American aircraft equipped with cameras began regularly overflying those parts of the Soviet Bloc countries they could reach, taking photographs, listening to the Russian pilots’ radio chatter and registering their radar transmissions. At first these suggested the Russians were still using modified Allied equipment left over from the war. But from about 1950 a good few American reconnaissance aircraft simply disappeared, some of which were known to have been shot down. It was clear that with the help of their ever-improving ground-based radar, Russian AAA (anti-aircraft artillery) batteries and early jet fighters were making aerial spying too risky to continue in its present ad hoc form. In 1951 the Americans reasoned that since the MiG-17, the best Soviet interceptor of the day, struggled to reach a height of 45,000 feet without doing a dive-and-zoom manoeuvre, a reconnaissance aircraft that could easily reach 60,000 feet was required. Coincidentally the USAF badly needed a new jet-powered medium bomber to replace the ageing propeller-driven Douglas B-26 Invader. With nothing home-grown in sight the Americans bought an existing foreign aircraft to build under licence, something they hadn’t done since the First World War when they built their own version of the British S.E.5 biplane fighter. 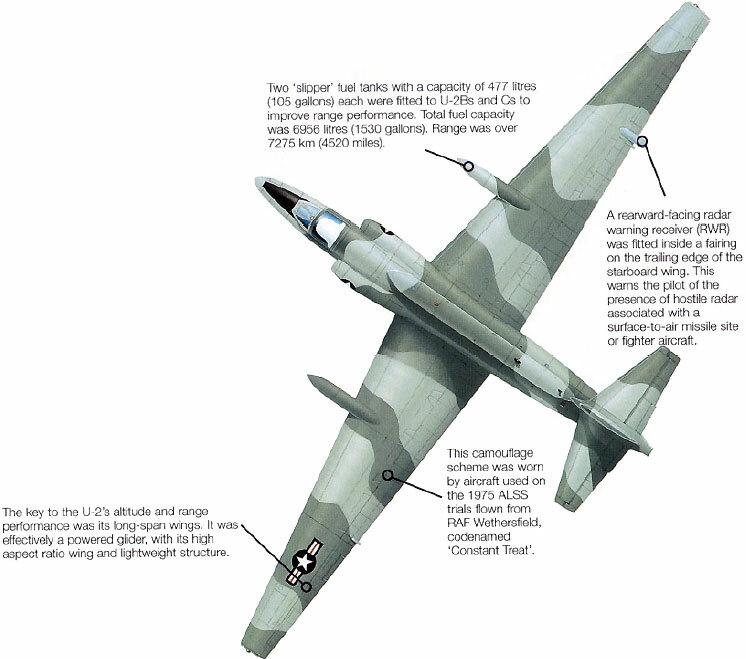 Their new purchase was also British: the English Electric Canberra. It was the twin-jet medium bomber the RAF was already flying in a photo reconnaissance version, the PR3. The Canberra entered USAF service in mid-1953 as the Martin B-57 and was itself quickly modified for reconnaissance. By early 1954 several RB-57As were based in Germany. With their greatly enlarged wings these could reach 64,000 feet and it was generally reckoned this was safely above the range of Russian ground-based radar, let alone of anti-aircraft missiles. Within a year, though, the Soviet MiG-19 entered service, an interceptor that could reliably exceed 50,000 feet, with later versions certain to improve still further. It was obvious that, to be safe, any future photo-reconnaissance aircraft would now need to fly considerably higher. The Air Force’s urgency was compounded by increasing losses of their existing reconnaissance aircraft while overflying Iron Curtain frontiers, none of which was capable of going much above 33,000 feet. The best of these was probably the RB-47, a reconnaissance version of SAC’s basic long-range jet bomber, the B-47. One of these first overflew the USSR in 1952 and since then three had been lost. In late 1952 the National Security Agency came into being with a remit that included responsibility for all overflights of ‘denied territory’, as the Soviet Bloc countries and China would come to be known. The following year the USAF issued an Operational Requirement for an ultra-high-altitude reconnaissance aircraft capable of staying aloft for long overflights of enemy territory. Even as Martin tried different wing shapes and lighter construction to get its RB-57s to fly higher, two other aircraft companies, Fairchild and Bell, were at work on designs to meet the requirement. The Lockheed Corporation soon got wind of this and also began to work on the project. The firm had been building successful aircraft since the 1920s and had produced one of the best and fastest propeller-driven fighters of the Second World War: the twin-boom P-38 Lightning. The Lightning’s designer was a talented young engineer named Clarence ‘Kelly’ Johnson. The son of Swedish immigrants, Johnson was brought up in the wilds of Michigan in conditions of considerable poverty. Fascinated by aircraft and ashamed of his family’s penury, he studied his way to the University of Michigan as an aeronautical engineer. There he conducted tests on a model of a new aircraft sent by the Lockheed Corporation, which lacked the university’s advanced wind-tunnel facility. Johnson’s work on their project impressed the company, who recognised him as an intuitive engineer. As soon as he graduated Lockheed offered him a job. He moved to California and in the early 1940s became one of the design team that created the beautiful Constellation airliner. In 1943, in conditions of great secrecy, ‘Kelly’ Johnson designed an airframe around a British Halford (later the de Havilland Goblin) turbojet engine, itself one of the most closely guarded of wartime secrets. This, the P-80 Shooting Star, became America’s first jet fighter in squadron service. In time the P-80 was successfully developed into the more advanced F-94 Starfire fighter as well as the extremely successful and ubiquitous T-33 Shooting Star trainer, scattered examples of which are still flying today as proof of the excellence of Johnson’s original design. Lockheed’s factory in Burbank had the capability of working in conditions that during the war were screened quite literally from inquisitive eyes by a vast acreage of camouflaged netting draped over its buildings so as to look from the air like a rugged patch of terrain dotted with trees. This spirited deception had been rigged in case of Japanese raiders who in the event never materialised. But the tradition of secrecy continued in the secluded ADP (advanced development projects) area of Lockheed’s plant. This was known less formally as the Skunk Works – so named after an illicit still in the syndicated Li’l Abner strip cartoon. In late 1951 Johnson went to see the war in Korea for himself in order to ask American Air Force pilots what they wanted in a new jet fighter, a most unusual thing for an aircraft designer to do. Returning to Burbank he swiftly designed a stunningly fast interceptor that looked more like a rocket with little razor-sharp wings. Besides being capable of a speed of Mach 2 (some 1,500 mph, depending on altitude)* it could reach an altitude of well over 50,000 feet. This was to be the F-104 Starfighter: the first operational aircraft to fly at twice the speed of sound in level flight. In November 1952 Johnson showed his design to some sympathetic Air Force generals in the Pentagon who clearly thought it a winner. The principle of competition being essential, the USAF formally issued a General Operating Requirement for a replacement for North American Aviation’s F-100 Super Sabre, which was strictly a Mach 1 fighter. A mere four months later they plumped for Johnson’s design and commissioned Lockheed to produce two prototypes. The first flight of the F-104 prototype took place in February 1954. In January 1953 President Eisenhower had expressed himself dissatisfied with what little intelligence was being gleaned from the Soviet Bloc. That August an RAF Canberra undertook a daring flight deep into Russia to the missile test range at Kapustin Yar, north of the Caspian, and was very nearly shot down. Even flying above 50,000 feet it was lucky to get home and the shrapnel damage it sustained rendered the photographs it took useless. It was a graphic warning of how capable Russian radar and other defences had become. By then ‘Kelly’ Johnson was already hard at work on a high-altitude spy plane within the tight security of Lockheed’s Skunk Works. The new aircraft had the working code name CL-282 and he designed it to carry a 600-pound payload of sensors and cameras to a safe 73,000 feet. It would in any case have to fly above 70,000 feet where there was no longer enough moisture in the atmosphere for vapour trails to form and betray the aircraft’s presence. It would also need a range of over 4,000 miles as well as being stable enough for vibration-free photography. To save money Johnson based the fuselage on that of his F-104 with its single-jet engine, thus enabling the factory to use the same jigs, although he was now heavily constrained by the need for extreme lightness. This mandated a radical new design. To save weight he stressed the airframe to resist only 2.5g, or two and a half times the force of gravity. This was less than half the official USAF specification at the time for its aircraft of 5.33g. There was no main spar to link both long, slender wings: they and the tail were simply bolted to the fuselage. It looked like a jet-powered glider, an impression enhanced by a complete absence of landing gear, a further weight-saving measure. Johnson’s aircraft would take off from a trolley and land slowly on its belly, keeling over on the ground like a glider when it came to rest. Also like a glider the cockpit was unpressurised: the pilot would have to wear a space suit. Altogether, and especially when compared to all the other aircraft of the day designed for either extreme speed or altitude, the CL-282 gave an impression of fragility. In August 1954 the Soviet Union exploded a hydrogen bomb that the American military immediately feared was more advanced than its own weapon. Once again the US Administration voiced concern over the lack of detailed information about the Soviets’ progress. The need for a new spy aircraft was urgent. However, when ‘Kelly’ Johnson finally submitted his CL-282 design to senior Air Force scrutiny the generals were mostly unimpressed. To them it looked flimsy and unmilitary. Before storming out of the meeting Curtis LeMay told Johnson he was wasting his time: he wasn’t interested in a plane that had neither wheels nor guns, as well as only one engine. 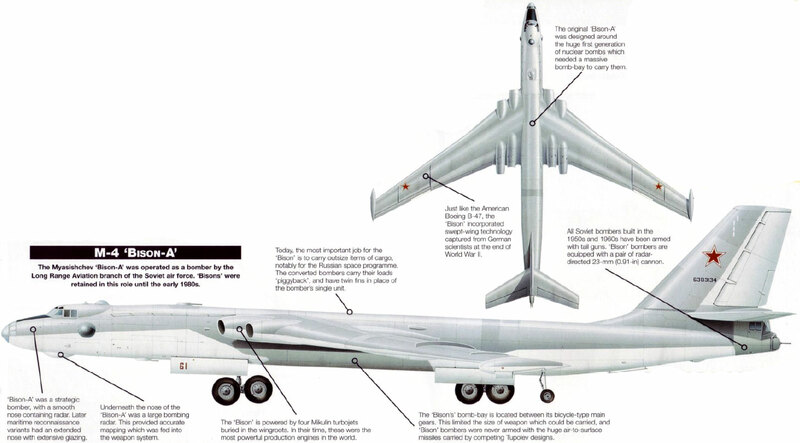 At the time SAC’s notoriously brusque commander may have been distracted by a more immediate concern, for in their May Day flypast that year the Russians had displayed a large new jet bomber, the Myasishchev M-4 (‘Bison’ in NATO terminology). This again shook the Americans badly. They hadn’t known the Soviets had any jet bombers and now assumed they must have entire squadrons of them. They were not to know that several of the handful of Bisons that had overflown Moscow had peeled off once out of sight, scooted round and flown over again to give the impression of an unlimited supply. In any case the Air Force rejected Johnson’s CL-282 in favour of a newly modified high-altitude Martin B-57 and the Bell X-16, a twin-jet design that in the event would never get further than the mock-up stage. However, what neither Johnson nor the USAF knew was that some months earlier the CIA had finally decided the military could no longer be relied on to provide detailed enough information about what was really going on behind the Iron Curtain. This was part of an ongoing battle for control being fought within the intelligence community, as also between it and the three services – each of which had an intelligence wing of its own. Control, of course, also meant large appropriations of funds. Behind-the-scenes disagreement raged as to whether ‘intelligence’ should refer to that gathered as ‘HUMINT’ by spooks in trench coats living dangerously or that obtained by ‘ELINT’ technology such as radio eavesdropping, radar and overflights. The CIA had already sparred with the generals over their estimates of the Soviets’ strength in the Korean War (as they would again in Vietnam). It now considered the matter of national security too urgent for further delay. Having been tipped off about Lockheed’s secret design some agents paid a call on the Skunk Works and examined Johnson’s CL-282 proposal. They quickly decided this was the way forward. Being the CIA they gave the project a code name of their own, AQUATONE. In March 1955 the Agency duly signed a $22.5 million contract with Lockheed for twenty aircraft and a senior CIA officer, Richard Bissell, was put in charge of the project. Building the aircraft was a Skunk Works project par excellence. The strictest secrecy was enforced from the first, Johnson having completed his design with only twenty-five other engineers involved. This had meanwhile been renamed the U-2, the ‘U’ standing for utility, a name that gave nothing away. Maybe some of LeMay’s criticism prompted a rethink, for Johnson now added bicycle-style landing gear on the aircraft’s belly, one wheel behind the other, with a couple of jettisonable outriggers with little wheels near each wingtip (known as ‘pogos’) for taxiing and take-off. The blanket secrecy made production of the first few aircraft far from easy: a project of such technological challenge and political implications was always bound to involve a great many people. There was also a subtext of vital importance to the White House. President Eisenhower was eager to keep relations with Moscow on as amicable a footing as possible, which meant that in order to avoid accusations of deliberate violations of Soviet airspace by US military overflights he insisted that any new spy plane had to look like a civilian project. If for any reason one were shot down its fragility, civilian pilot and lack of armament might speak in its own defence. At a pinch it could be disclaimed as an embarrassing gaffe by the private sector. This merely added to the imperative need for secrecy. There were also delicate matters of demarcation to negotiate. Although AQUATONE was a CIA project the USAF was badly needed for such things as selecting the best pilots to fly the U-2. These would have to be ‘civilianised’ with a guarantee of reinstatement plus any overdue promotion at the end of their U-2 duties. The Air Force would also be responsible for plotting the missions, supplying up-to-date weather reports and providing operational support such as fuel and servicing wherever the U-2 was based or needed to land in an emergency. It took time to win over high-ranking officers like General LeMay to OILSTONE (as the USAF knew AQUATONE), but once others at the Pentagon saw the aircraft’s potential Air Force enthusiasm and support grew. Lockheed’s technical requirements were many and varied but whatever happened it remained vital that nothing could ever be traced back to the CIA. In documents and even in speech the U-2s were habitually referred to as ‘articles’ and their pilots as ‘drivers’. Sundry outside contractors were needed to supply or invent such things as ultra-accurate navigation systems, little tyres for the outriggers, pressure suits for the pilots, cameras of strictly defined weight and dimensions with lenses of a certain focal length, as well as sensors of all kinds. Cover stories had to be hurriedly invented. Lockheed ordered altimeters that would register to 80,000 feet from a company whose existing instruments were calibrated to a mere 45,000 feet. To explain this Lockheed claimed they were needed for a rocketry programme. Jet fuel was also a problem because at the low atmospheric pressure of 70,000 feet ordinary fuel would boil and evaporate. The Shell Oil Company had to be brought in to devise something that would remain stable over a wide spectrum of temperatures and pressures. They finally came up with JP-7, a different formulation of the kerosene fuel used in ordinary jet engines. They produced several hundred thousand gallons of it, but only by using petroleum by-products that normally went to make the company’s Flit fly spray, temporarily causing a nationwide shortage.3 That summer flies buzzed unmolested so that spies might fly unscathed. Testing the aircraft required a place hidden well away from casual observers. It was Richard Bissell who eventually chose Groom Lake in Nevada’s Mojave Desert, on the other side of a range of hills from the Atomic Energy Commission’s Proving Ground with its growing rash of underground test craters, and all within a securely controlled perimeter known as Area 51. By July 1955 a new airstrip had been built to the fringes of the salt pan and the first aircraft delivered. That August the U-2 made its first flight. Meanwhile, the Air Force Chief of Staff, Nathan Twining, was lobbying hard for SAC to take charge of the U-2 and put it under the command of General LeMay. It is possible that LeMay had become more reconciled to the design he had so contemptuously dismissed when it was still the CL-282. It is equally likely that he now saw its possibilities at a time when there was no available alternative and wanted Air Force control of this valuable asset. However, President Eisenhower himself put an end to this, adamant that it must remain a civilian project. As with any aircraft, testing the U-2 prototypes was carried out methodically, gradually working up to the design speed and altitude and with time spent on the ground for modifications. The extreme altitude required of the aircraft brought its own novel difficulties since it was designed for optimum performance at over 70,000 feet and few men had ever flown that high for more than a minute or two. After all, human space flight would not become a reality for another six years, with Yuri Gagarin’s orbital flight in 1961. Back in mid-1955 the upper fringes of the Earth’s atmosphere had only ever been examined at any length by unmanned balloons. In May the previous year Major Arthur Murray in the Bell Aircraft Corporation’s X-1A rocket aircraft had briefly reached at least 83,500 feet (25,450 metres) and possibly even 90,000 (27,432 metres). With the exception of a handful of Canberra pilots on both sides of the Atlantic there was no one who had yet ventured much beyond 64,000 feet, still less to 73,000 feet while able to remain there for hours at a time. That summer of 1955, high altitude was to be the U-2’s private domain. As the weeks passed the spindly black aircraft was allowed to climb higher and higher in the thermals above Nevada.